Bobby Hull is regarded as one of the greatest ice hockey players of all time and perhaps the greatest left winger to ever play the game. Hull was famous for his blonde hair, blinding skating speed, and having the fastest shot, earning him the nickname "the Golden Jet". He possessed the most feared slapshot of his day. In his 23 years in the National Hockey League and World Hockey Association, he played for the Chicago Black Hawks, Winnipeg Jets and Hartford Whalers. Hull was elected to the Hockey Hall of Fame in 1983. 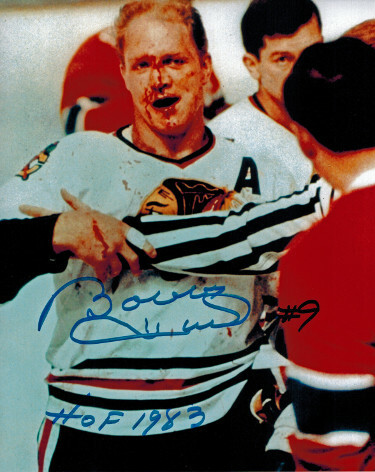 Bobby Hull has hand signed this famous Chicago Blackhawks Blood 8x10 Photo with #9 HOF 1983 inscription. Schwartz Sports Hologram and Certificate of Authenticity from Athlon Sports Collectibles.